Google Domains is the latest product announcement from the company which is in beta at this point of time. 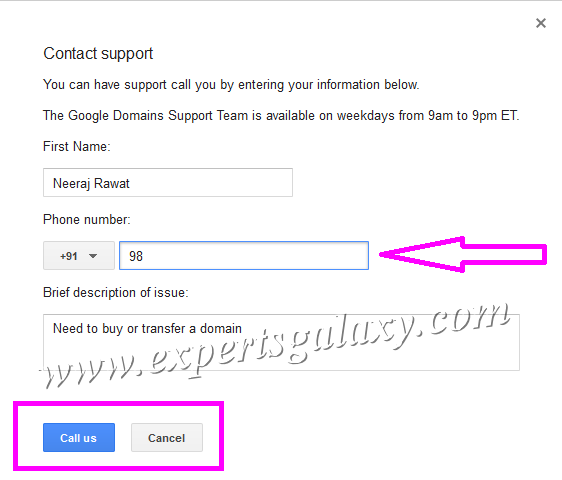 I had registered many domains with Google via different registrars and recently transferred almost most of them to different registrars as I was facing issues in getting proper support. If you are a regular reader here then you might have read the post of transferring Experts Galaxy to another registrar. At the time of launch itself, I requested an invite for Google Domains and it is the first product from the company which I am trying so late after the beta launch. It seems something non-invitational from Google and even if I have signed up now then also I can not invite anyone else the way I invited people for Google Plus. Today, I got an email from Google Enterprise Support as I contacted them earlier for my issue and as the conversation kept on going via emails, I also discussed the invite thing with the support staff. Her name is Naiara, she forwarded my request to the concern team and guess what? I am in the control panel to register or transfer a domain. Yes, you got it right as finally I got an invite to sign up for this Google Service as well. Now lets go ahead and see how the control panel and how is it different from other domain registrars. You can read the features here which are provided with the service. Earlier as well, when Google was offering the service via other Registrars then too it was offering a domain registration for only $10 with free private Whois. It was the cheapest one available among different registrars followed by Name.com where you can register a domain for around $10.99 and can also get a free Whois guard using a coupon code. So, I thought of contacting support as I was aware that like other Google's paid services, one can get support via email or phone. So, I clicked on contact support option and you can see the popped up screen as shown in the image above. I was amazed to see the next screen as shown below which stated " You can have support call you by entering your information below" which I get with Amazon India where they call me whenever I need the support. This confirmed to me that Google Domains would change the domain registration business as Google did with every other business they came into. I am sure once it will be available for everyone then it will be the end of Godaddy era in domain registration as people are frustrated with their support including me. 2) You need to have a credit card with US address. 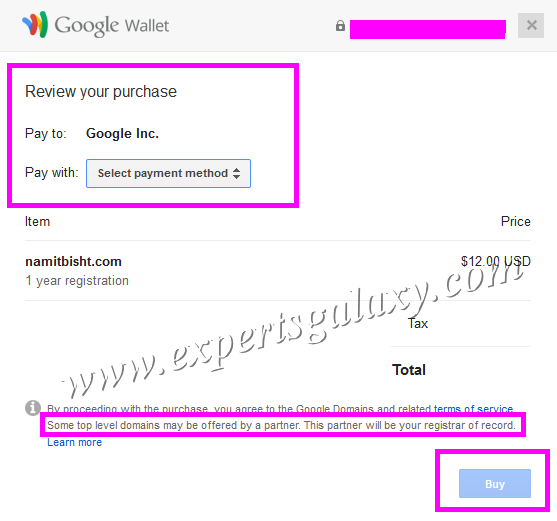 I was glad to see Google Wallet back on the next screen as I used to use it for registering or renewing my domains with Google via different registrars. 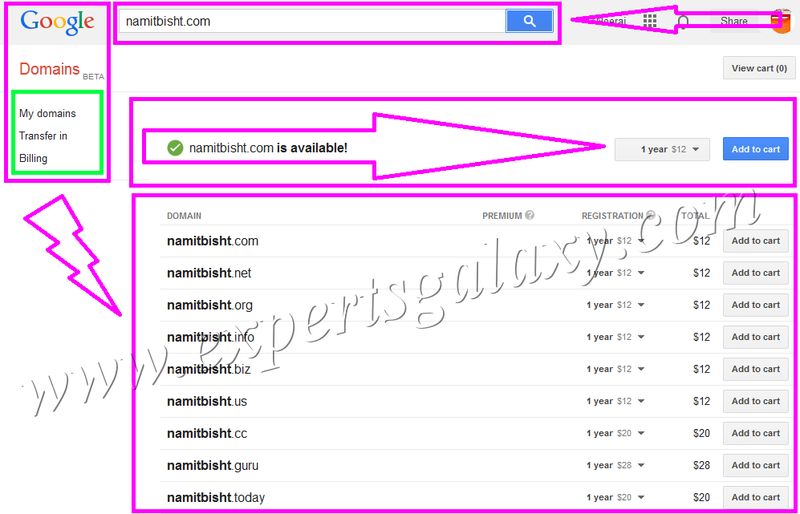 Once Google closed the checkout then I had to add my card details separately in all the domain administrator accounts for each domain which was quite frustrating as earlier I was able to renew my domain from a central account. Once I saw the screen as shown in the image below, I thought that I would be able to complete the purchase. 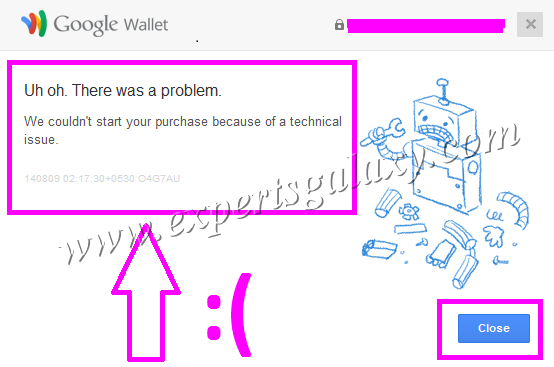 After adding the card details I was thinking that the department who sent me the invite code was aware of my country and being a Google fan, I would be able to complete the transaction but when I tried to do a successful checkout, it failed because of a technical issue as shown below and then I realized that the support guy with whom I interacted over the phone was right. I need to have a Credit Card registered under a US address which is the second condition as mentioned above. 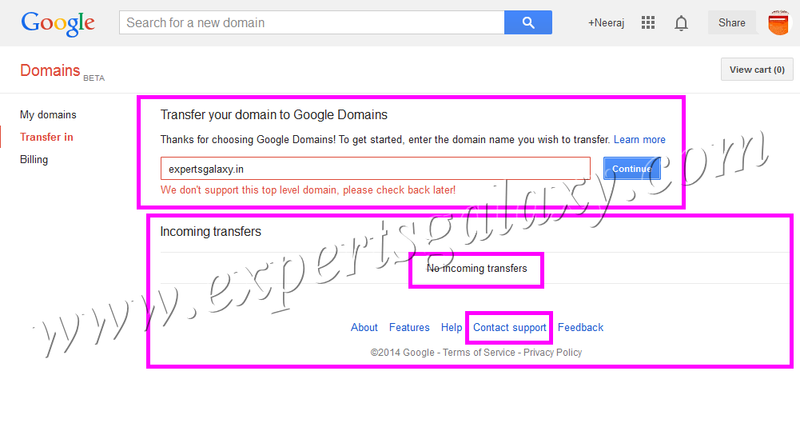 Before the failed checkout, I was thinking to transfer Experts Galaxy back to Google as recently I transferred it to Name.com but then I thought to do it at the time of renewal, so that it would totally be a Google relied blog as I am hosting it on Blogger. 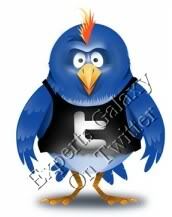 Then, I thought of transferring the domain www.expertsgalaxy.in which is set to expire next month. But I got an error as shown below and I should have understood the statement of the support guy. Whenever the service will come out of Beta, I will let you know and would also transfer many domains back to Google along with the ones registered with Godaddy. If you are a US resident then you can request an invite here to sign up for the service. Get ready for an amazing domain registration service which I experienced even if I could not register and transfer domains. Google Domains is the first domain registrar with whom I interacted over the phone without purchasing a Skype subscription to call US numbers. I am already quite happy with the domain registration service from Name.com and with the public availability of Google Domains, I would also get an alternate and nice domain registrar. The competition between both of them will provide improved customer service. I can give in written that the Godaddy era is over now and it always happened with the people and companies who think that they are the only one in the Globe. Do share your thoughts about the domain registration providers and which one is your favorite along with the reason so that others can check out at the same?